I tried making some machinable wax last night. It’s supposed to be harder than plain wax and mine wasn’t, or at least not noticeably. But I believe I can fix it by re-melting it and dissolving more plastic into it. Machinable wax is made from ordinary paraffin (candle) wax that has HDPE or LDPE plastic added to it to make it harder, more dense and to raise its melting temperature. I used HDPE that came from milk bottles. The ratio of wax to plastic is about 4 to 1 and I heard you could achieve that by just adding plastic to the wax until it won’t absorb any more. I did that and then used my electric fryer’s basket to strain out the extra. I realize now that the basket had too much undissolved plastic in it and that I probably should have waited more patiently and stirred the mixture more. I used 2 pounds of wax. I think it was just about the right amount for the 9×9-inch non-stick baking pan I used for a mold. Although it could have held more. Both my grocery store (in the canning section) and local Hobby Lobby store sold 1-pound packages of paraffin wax for $4. But Hobby Lobby also had 10-pound slabs for $15 ($1.50/pound). They also occasionally have their candle making supplies on sale and they sometimes have 40%-off almost anything coupons. Machinable wax has many uses. I was going to give this batch to a maker/hacker space for their members to use to practice machining. Machinable wax won’t damage cutting tools, it doesn’t create sharp swarf and it can be re-melted and reused. It’s also often used to make prototypes, molds, lost-wax castings and to test CNC programs. 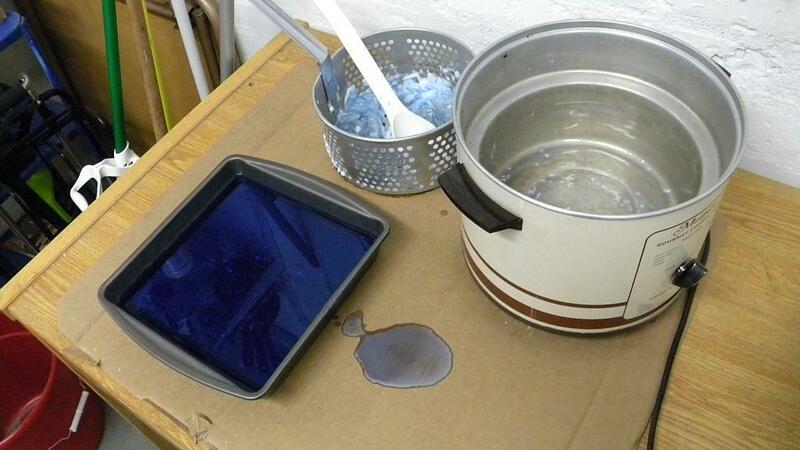 I wanted to dye my machinable wax a fairly dark blue like you see in the picture. But when it cooled it was a much lighter blue like the spilled wax on the cardboard. I bought my dye from Hobby Lobby, which only offered one choice, a pricey ($5) package containing small amounts of red, yellow and blue. I used up all the blue on just this one batch. I’m going to find a candle making forum and ask the experts where I should go to buy more. I also want to ask them if copper pipe would make a good mold for round wax rods for the lathe. DO NOT try to use food coloring to dye your wax. It contains water and when you add it to the melted wax it will boil and spit creating an unsafe condition. DO NOT melt your wax over an open flame because it’s very flammable, especially before you begin adding plastic to it. And DO NOT use any kind of heat source that you can’t easily and precisely control the temperature of. Many people make wax candles and it’s not a particularly dangerous hobby. But if you aren’t careful you can burn your house down and/or severely burn yourself. You should have an accurate way to measure temperature because pure paraffin wax can burst into flames at 390° (F), although its flash point will increase as you add plastic or other additives to it. Candy thermometers usually cost less than $10 and a non-contact infrared thermometer, which is what I used, can be purchased for $20-$30. I was very cautious and never let the mixture get hotter than 290° because I was making it indoors. I may have turned the temperature up more if I’d been making it outside in my driveway. By the way, paraffin wax melts somewhere around 125° to 165° and HDPE melts at about 266°. The flash point of HDPE is about 650°. I wore protective clothing and safety glasses to protect myself in case I spilled any wax. I also wore welding gloves when I poured the wax into my mold. He did, and ended up making quite a bit of it. I never tried machining it, but it looked and felt pretty solid. Most of what he made was donated to the local makerspace for beginners to practice on. The stuff I made was very usable but it wasn’t as hard and dense as the commercially made wax I bought to compare it to. But it was good enough to practice how to square a block and it could be used for other things also. I think my electric fryer wouldn’t get hot enough to let me dissolve more plastic into the wax. I suspect another 20-25 degrees might have been enough. There’s also a chance that I wasn’t patient enough. I have a lot of wax and plastic left over and I would like to try again but I don’t know how to increase the temperature of my fryer and I haven’t seen any better ones at the Goodwill store. I’m too cheap to spend money on a brand new fryer. Shawn, please let us know how your batch came out. How long does it normally take for the plastic dissolved? I tried for 30 minutes with 300 degree on for just a small piece of plastic and it never dissolved. It melted and clump into a ball for ever. Please help. It dissolves slowly. It probably took at least 40 minutes for the first small batch I made. Are you sure you used HDPE? I’d also get a thermometer and confirm that the temperature was as hot as you think it was.